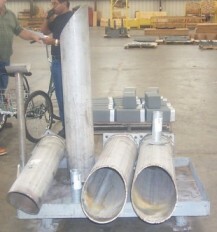 Stainless Steel Stanchions for a Power Company | Piping Technology & Products, Inc. Piping Technology & Products, Inc. provided 35 stainless steel stanchions for pipe sizes 4 to 18 inches for a power company in Alabama. The ends of the stanchions have shop-cut end connections that will allow field welding without any modifications by site personnel. Some stanchions were provided with straight pipe connections and others were provided with elbow connections. The minimum height requirement provided for a centerline height equal to approximately 16″ while the maximum pipe centerline was required to be at approximately 58 &frac12;”. The stanchions were designed at 1100°F and sustained a maximum design load of 18,000 pounds. The stanchion base plates are 304 stainless steel and the tubes are constructed of A240 GR.304 seamless pipe. Do you need stanchions for your company? Request a quote and get a response within 48 hours!